Felix Philippoteaux (1815-1884) was born in Paris where he trained with Léon Coignet (1794-1880). He soon specialised in history and portrait paintings and started exhibiting at the Salon in 1833. He also produced battle scenes, some of them in a panorama format with the assistance of his son Paul Dominique Philippoteaux (1846-1876), who would be at the forefront of a new generation of panorama painters. Félix Philippoteaux was awarded the Légion d'honneur in 1846. This painting is a fine example of Félix Philippoteaux' battle scenes, a genre in which he specialised with success. 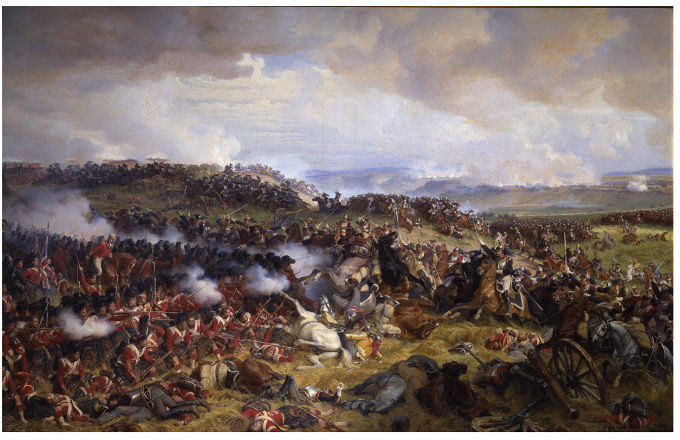 It shows the battle of Waterloo between the British army and the French Napoleonic army, which took place on the 18th June 1815. This very accurate representation of warfare tends to re-create the past, mainly the Revolutionary and Empire period. This type of representations draws upon 17th-century Dutch examples such as Philips Wouverman (1619-1668) and differs from the Realist interpretation of the subject. Battle scene set in a hilly landscape: tangle of soldiers and horses with a canon in the right foreground, pervaded with smoke, under a large cloudy sky. Given by F. R. Bryan, 1880 (may have formed a pair with 85-1880). 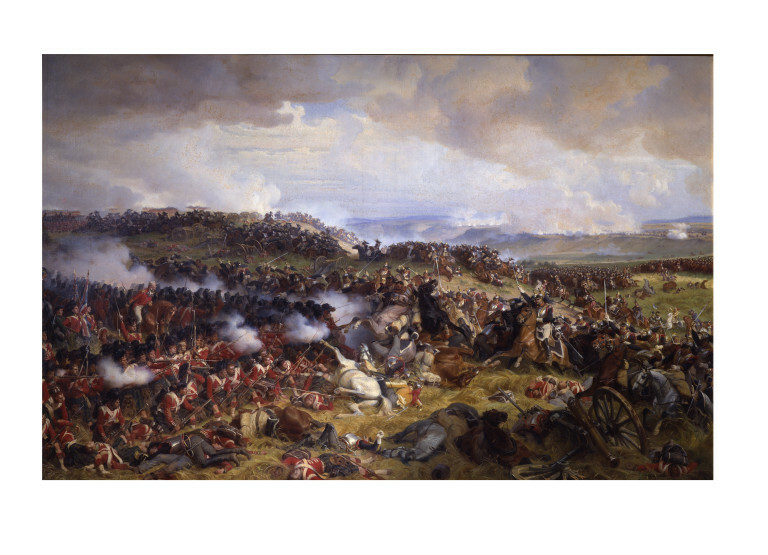 Historical significance: The present painting depicts the Battle of Waterloo, which took place on the 18th June 1815 in the South of Brussels (Belgium) and involved the British, Germans, Belgians, Dutch and Prussians against the French Grande Armée of Napoleon. Commandant Lachouque (written communication) identified the scene as representing the British 5th Division under Sir Thomas Picton (1758-1815) receiving in square the 5th and 10th French Cuirassiers. On the right is represented the charge of the French cuirassiers with their blue uniforms at the British army in red on the left, clustered around the Union Jack held by two standard bearers. Battle scenes in the 19th century draw upon a long tradition since the representation of warfare on Antique low-relief and its revival during the Renaissance, which reached its peak during the 17th and 18th centuries in Italy and the Netherlands. 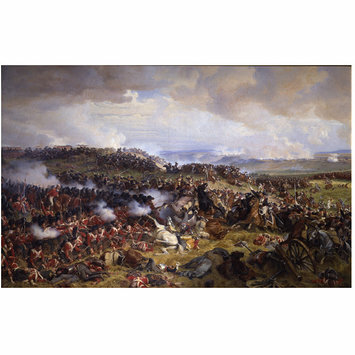 Although 19th-century Realist artists developed a taste for military battles as an illustration of the Napoleonic campaign, they were more concerned with people and their sufferings. In this regard, Philippoteaux is closer to the art of Ernest Meissonier (1815-1891) who devoted himself to re-creating the past, chiefly of the Revolutionary and Empire periods with a meticulous attention to historical details. Ruskin who saw the painting at the Royal Academy exhibition in 1875 praised it as a 'carefully-studied and skilful battle piece'. The museum also owns an oil sketch for this composition (P.1-1935). History painting, i.e. depictions of non recurring events based on religious, classical, literary or allegorical sources, particularly developed in Italy during the Renaissance (15th-16th centuries). History painting could include religious themes, or depictions of momentous recent events, but the term was most frequently associated with Classical subject-matter. However a renewed impetus was given to religious subjects after the Council of Trent (1545-63), which stipulated new iconographical programmes. The development of art treatises, in which the compositional rules guiding the art of painting were discussed also notably, influenced the evolution of history painting. From around 1600 history painting's principal rivals: still-life, landscape and genre painting began to emerge as independent collectable genres. Furthermore, the Rococo taste for the ornamental in the early 18th century prioritised the decorative quality of history painting, so that subject matters became more entertaining than exemplary. There was a renewed interest in history painting during the Neo-Classical period after which the taste for such pictures faded towards the end of the 19th century when an innovative approach to the image was led by the Symbolists and was developed further by subsequent schools in the early 20th century. Kauffmann, C.M. Catalogue of Foreign Paintings, II. 1800-1900 . London: Victoria and Albert Museum, 1973, pp. 80-81, cat. no. 176. E. T. Cooke ed., Ruskin on pictures,, ii, London, 1902, p. 261. E. Benezit, Dictionary of Artists, vol. 10, Paris, 2006, p. 1327.